Seek out the cynics as they really care. 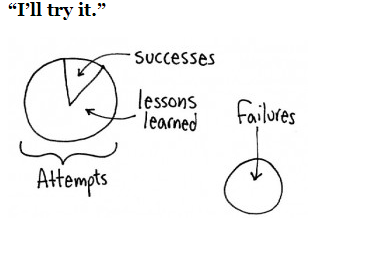 Experiment in a “safe to fail” environment. The only way to understand a complex environment is to act within it. I think I am probably taking them out of context. But Chris mentioned social complexity, so I feel justified. I think this is good advice for entrepreneurs. As you talk to potential customers, investors, what you really want to be listening to are the cynics. Listen carefully and try to understand why they are saying what they are saying. Did you fail to communicate your vision? Is there a pattern you can observe (in the cynicism) and learn from? If you are intensely curious about the relationship between Creativity, Imagination, Flow, Intelligence and Finding your passion, The Element by Ken Robinson is a must read. Ever since I first heard Ken Robinson’s TED talk, I was hooked to his ideas. Almost everything he said resonated with me and I could not consume enough of his talks, interviews and videos. So when I found out about his book “The Element”, I immediately got the Kindle version. I have read 5 chapters so far and felt that even before I complete the book, I should share a few snippets. I hope you find the book and read it so that we can have several conversations. It changed my idea of intelligence and I am sure it will change yours too. I believe strongly that if we can each find our Element, we all have the potential for much higher achievement and fulfillment. I don’t mean to say that there’s a dancer, a cartoonist, or a Nobel-winning economist in each of us. I mean that we all have distinctive talents and passions that can inspire us to achieve far more than we may imagine. Understanding this changes everything. It also offers us our best and perhaps our only promise for genuine and sustainable success in a very uncertain future. Being in our Element depends on finding our own distinctive talents and passions. Why haven’t most people found this? One of the most important reasons is that most people have a very limited conception of their own natural capacities. This is true in several ways. The first limitation is in our understanding of the range of our capacities. We are all born with extraordinary powers of imagination, intelligence, feeling, intuition, spirituality, and of physical and sensory awareness. For the most part, we use only a fraction of these powers, and some not at all. Many people have not found their Element because they don’t understand their own powers. Most students never get to explore the full range of their abilities and interests. Those students whose minds work differently—and we’re talking about many students here; perhaps even the majority of them—can feel alienated from the whole culture of education. This is exactly why some of the most successful people you’ll ever meet didn’t do well at school. One of the enemies of creativity and innovation, especially in relation to our own development, is common sense. The play-wright Bertolt Brecht said that as soon as something seems the most obvious thing in the world, it means that we have abandoned all attempts at understanding it. most people have a narrow view of intelligence, tending to think of it mainly in terms of academic ability. This is why so many people who are smart in other ways end up thinking that they’re not smart at all. The highest form of intelligence is thinking creatively. Creativity is very much like literacy. We take it for granted that nearly everybody can learn to read and write. If a person can’t read or write, you don’t assume that this person is incapable of it, just that he or she hasn’t learned how to do it. The same is true of creativity. Creativity is a step beyond imagination because it requires that you actually do something rather than lie around thinking about it. It’s a very practical process of trying to make something original. It may be a song, a theory, a dress, a short story, a boat, or a new sauce for your spaghetti. Regardless, some common features pertain. Imagination underpins every uniquely human achievement. Imagination led us from caves to cities, from bone clubs to golf clubs, from carrion to cuisine, and from superstition to science. Through imagination, we can visit the past, contemplate the present, and anticipate the future. We can also do something else of profound and unique significance. People who work creatively usually have something in common: they love the media they work with. Musicians love the sounds they make, natural writers love words, dancers love movement, mathematicians love numbers, entrepreneurs love making deals, great teachers love teaching. This is why people who fundamentally love what they do don’t think of it as work in the ordinary sense of the word. They do it because they want to and because when they do, they are in their Element. Robinson Ph.D., Ken (2008-12-01). The Element: How Finding Your Passion Changes Everything Penguin Group. Kindle Edition. 1. I was reading my email. There was one from academic.edu. I found a few good articles and clicked on each one of those for later reading (in the process, opening up a few tabs in my browser). This one is about teaching better search through Boolean expressions and how to use ANDs and ORs through a game like “Alien Invaders”. I thought that was a bit of a cool concept. 3. In the very first para, I hit a reference to “TILT – Texas Information Literacy Tutorial”. Even though it was not a link, I opened a new tab, Googled it and started reading it. 4. While reading TILT, I came upon a term called “Active Learning”. I had some vague notions of what it was, but wanted to make sure. Googled “active learning” as well and started reading an article on Active Learning. 5. While reading , I paused and started thinking. Suddenly I felt I was like a program being executed in a computer. A processor executes a few instructions, jumps to a procedure/function, stacks the existing context and starts executing the new set of instructions. If this new procedure has a call to another, it repeats this process of stacking stuff and jumping again. The only difference is that when it finishes execution of the process, it goes back to the original unless it is interrupted by an external event. If you are not a bit of a geek, this para will make no sense to you. My apologies. 6. Anyway, this thought of my being a machine, made me open up another tab and type this post (because I wanted to capture it). 7. I skipped mentioning all the tweets and scoops I indulged in, during these three reads. 1. Why do I do this? Because I can, is one answer. What was the equivalent when I am reading offline? Probably referring to a dictionary or making a note of these terms that I want to research later, or writing down an idea. It is not that different from these jumps but far less, I am sure. 2. Is this bad? I am sure it shows lack of focus. But I am learning a lot in the process and sharing bits of it. So is it bad? I don’t know the answer to that one. 3. If I want to arrest this habit, what should I do? For one, I can use a browser that do not allow tabs 🙂 But I guess, that may not completely solve the problem. 4. Should I even bother to arrest this problem? I am having fun. Not likely to happen, I think. Now that I interrupted whatever you were doing, to read this post, let me hit Publish and go back to my reading. Share your thoughts on how you handle these situations. Are writers of articles like programmers. By throwing in references to other concepts and articles, are the causing the readers (the executing programs) take a few conditional jumps? If you think I am crazy, you may actually be right. How might we better collectively solve problems facing our neighbourhoods? How might communities look out for each other more? How might we provide a safe space for positive and constructive action? How might we help passive citizens become active contributors? How might the role of the government evolve in the future, with regards to local neighbourhoods? Do you have ideas on any one of these? I would certainly be interested in discussing “how might we help passive citizens to be more active”. Here is the link to the challenge if you are interested in contributing your ideas. Also check out how the challenge works. Studying their challenges is one way to learn about the Five Step Open Innovation Process they use and the way they leverage collective intelligence on a global scale to solve important world problems. What do you write or compose? Blog posts? Poems? Videos? Grocery lists, computer code, or song lyrics? Whatever you write, on Friday, October 19, use the hashtag #whatiwrite to share your compositions with the world as part of this year’s National Day on Writing. In the spirit of “Writing Day”, here is my little post on what I write. What I write is fairly well reflected in this Category Cloud. 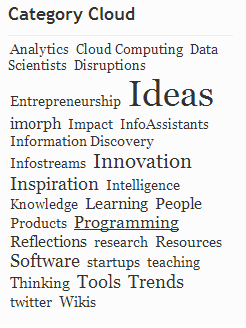 Ideas and Innovation dominate the topics followed by a sprinkling of others. I am interested in how people learn and teach, about Intelligence. Since my company works on tools for Information Intelligence, there is a sprinkling of topics on Information as well. This is my main blog. Here is a link to Why I Write (from last year). Why have a day for writing? It should be every day. But like Father’s Day and Mother’s Day and Teacher’s Day, dedicating a day to recognize some one or something is a great idea. Fascinating. The link above has a bit more description for each law and I took it out so that you can go to the page and enjoy them. In this nice compilation Maria discusses How to Find Your Purpose and Do What You Love. I am never tired of reading this and every time I read it, it triggers a different set of thoughts. In this iteration, I latched on to “what you like vs what you would like to like” by Paul Graham. Here is a bit of context. I think you have a gut feel for what you like. You may have it early in life or you may discover it, as you progress through life. What you would like to like may be dictated by factors other than yourself. What about you? If you sit back and think about it a bit, do you see the difference in your case? Four of us sat in a room in Bangalore. It was some time in 2001. I came down from San Jose, CA. My friend came from Seattle, WA. The other two were from Bangalore. We were discussing some ideas for our first product. An Integration Server – something that pulls information from several sources on the web to create your own server and our plan was to build it in XML. I was doing a lot of research in XML at that time and was really excited by the potential of that technology. Our concept was a slice of Web as your own database. A product called Intelliweb where you can create a web site with a bunch of semantic components. Our goal was to start with some thing simple – a few components for Dreamweaver which was the most popular web development tool at that time. InfoMinder – a tool to track information on the web and send you alerts on changes. I started the company, inspired by a paper from Tim Berner’s Lee on Semantic Web and created the first version of our website. In our Bangalore meeting, we asked ourselves a simple question. Which of these technologies is closest to being delivered? The answer was InfoMinder. We thought it was a a couple of months to being a product. We also decided to work on intelliweb components in parallel. This story has a lot of twists and turns. We started on Dreamweaver components. Built a prototype and even gave a demo to Dreamweaver user group in San Francisco. It was well received. We followed it up with some informal market research and concluded that it was not a viable business. I created a presentation on the Integration Server (we called it XML Server) and tried to raise money. No one understood what the product was (at least the people I met) and why it was needed. So we dropped that. So why am I writing all this now, almost a decade later? Tara mentioned in a tweet that Internet Archive has over 10 peta bytes of data. So I went back and looked at different snapshots of our site over the years. There were over 82 captures. Here is the link. Here is the ways we morphed. Somewhere around 2004, we stopped updating the website since most of our traffic was coming directly to InfoMinder site. Now that we are planning to launch a couple of products, our website may become active again. iMorph will produce various Information Engines – tools to discover, aggregate, filter and mine web content for your business. Here is a great story on how Shell plans to save 100s millions of dollars using Semantic Search. They estimate the savings to come from cutting the time of training their employees by providing right information based on the employee’s profile and interests. By rolling out technology to automatically identify and deliver the information they need, from databases, blogs and social media. As both internal and external information explodes, every company needs to find innovative ways to discover, aggregate, filter and distribute information based on job and interest profiles of employees. It is nice to see this story.